Another great find at The Finders Keepers markets in Sydney on the weekend was the beautiful sustainable baby clothes from Melbourne lable Fable Baby. There were hand-screenprinted polka dot cropped sweaters and stripey leggings, farm animal prints and knottied onesies. I love the cuffed sleeves on the tees. Oh, and the knits were beyond cute (poncho with pom poms, anyone?). Fable Baby was established exactly one year ago by cousins Phoebe Newlan and Prue Ryan with their combined backgrounds in textile and fashion design. Fable Baby uses only high quality organic and/or locally-produced fabrics. Knitted pieces are made from either organic cotton yarn from Peru or hand-dyed wool and silk from the Otways of Victoria. All garments are designed, hand-printed and handmade in Melbourne. The current collection includes tees, knotted onesies, shorts, pants, bibs and the cutest knits you ever did see. All babywear items are thoughtfully designed with easy dressing in mind. For new Mums, that design element can make all the difference between a lovely clothing gift that sits on the shelf and one that is worn daily. With lots of unisex colours and designs, Fable Baby is a no-brainer go-to gift for a newborn or baby shower. You can find Fable Baby in the online store as well as stockists listed on the website. Hi Liz, you are so very welcome. They are gorgeous! And a huge congratulation on your new arrival in September. How exciting... enjoy! These are all really cute. I especially love that knitted hooded vest for my little one. 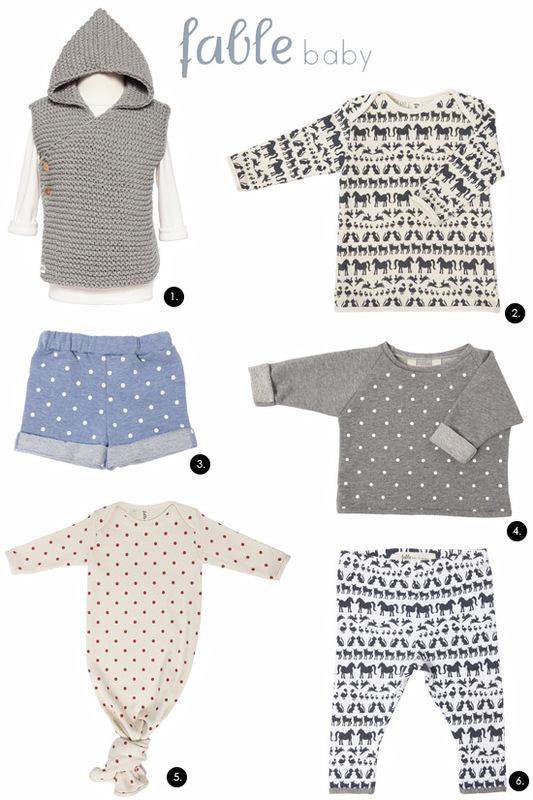 I am in love with these fable baby clothe designs. I think it is made out of cotton fabric and will be useful to keep babies relaxing throughout the day. I love the grey hoodie with the wooden toggs on it. It looks so warm.